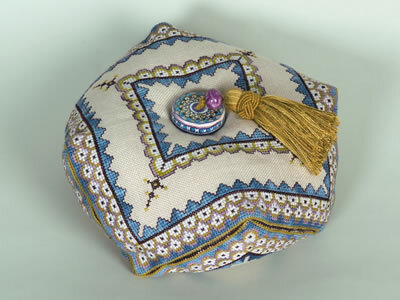 A large hat pins Biscornu designed by Giulia Manfredini, and inspired by the antique Deruta button. Complete stitching and finishing information. Deruta majolica bead and button, exclusively available from Giulia Punti Antichi, are not included. This is the seventh design of the serie “Deruta by GPA” inspired by old maiolica/pottery designs of Deruta art. Deruta is a beautiful old town of Umbria, Italy, full of history and art. We strongly advise you to pay a visit to this town. You’ll be enchanted…. A big thank to Mrs. Anna Lisa Piccioni, President of “Academy of Deruta Work” who has created for us beautiful beads, buttons and sewing accessories, and enabled us to design our models in tune with the antique Deruta designs. Each maiolica/pottery button and bead is unique since it is handmade and painted only for Giulia Punti Antichi by Le Antiche Fuseruole. For this reason your “Deruta embroidery” is a unique piece of art. Deruta majolica button and bead are not included in chart pack. D7 Deruta majolica kit: Flat thick majolica button VARIO + one light purple small Fuseruola (majolica bead). Stitches Cross stitch over two, Back stitch over two.